There’s a new craze in cool dog accessories and that’s the dog bandana! It may just be a printed piece of fabric but tied around your pooch’s neck it is a trendy fashion statement and looks fabulous in photos. Most dogs wear their bandana with pride and think they look very smart! They can also be useful for cooling down a hot dog or after some types of injury. There are plenty of bandanas out there so here is our useful guide to choosing, using and looking after the best dog bandanas. 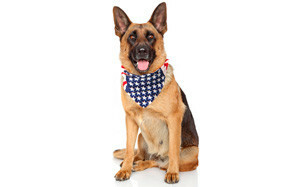 A totally patriotic bandana for dogs! Not only is the unique stars and stripes design a cool look for your pooch but it’s made from a durable nylon so it will survive a lot of rough and tumble. It comes pre-folded and ready to wear. The dimensions are 22 x 22 inches so it will suit medium-sized and larger dogs but you can buy it for smaller pooches too. You simply have to fold it over again to reduce the size. It comes packed in an attractive package and makes a perfect gift. You could even buy a matching one for yourself and you could be patriots together! The birthday boy will look very dapper in this special bandana dog collar. It’s available in blue and printed with ‘Birthday Boy’. The fit will be great for medium and large dogs as long as their neck circumference is under 23 inches. It is essentially a triangular piece of material with cords that can be tied at the back of the neck and measures 27 inches in total. For smaller dogs, you would need to roll it up a bit to fit. The bandana is made from 35 per cent polyester and 65 per cent cotton so you can pop it in the washing machine when it gets dirty. This is the bandana dog collar that is cool in more ways than one! On a hot day, all you have to do is soak the bandana in cold water and put it on your dog to keep them cool and comfortable for several hours. Heat stroke is a serious issue for dogs and this bandana has been scientifically designed to help cool your pooch down. The water evaporates from the special material and takes heat away from your dog’s body. It’s secured in place with Velcro fastening and the medium size measures 11 x 11 x 0.4 inches which will suit a small/medium dog. Other sizes are available. If you simply can’t decide what design of puppy bandanas to choose for your four-legged friend, this is the pack for you! You will get eight attractive bandanas in different classic plaid prints that will always be in fashion. One for every day of the week and one spare. The cotton and velveteen material is soft for maximum comfort and gets even softer once you have washed it, which you can do in a washing machine. The bandanas will fit any medium to large pooch. A natural, 100 per cent cotton pack of two bandanas so you can use one whilst the other is in the wash. Both designs are based on the US flag and when it is unfolded the dimensions are 22 x 22 inches. It will easily fit a larger dog but you can fold it over several times to fit a smaller dog. The bandanas are lightweight and will not cause discomfort, even in warmer weather. When you wash them, it would be worth taking care as the colours may run. 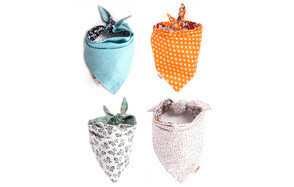 A pack of four Bandanas made from high-quality cotton. The bright, attractive patterns in bold blue, red, orange and green are printed on both sides so you effectively have eight to choose from! They fit larger dogs (perfect for a Labrador) but can be folded over to look great on a smaller pooch. They are made out of a durable fabric that washes well and all you have to do is tie them securely around your dog’s neck in a bow/knot. Another four-pack of pretty tie-on bandanas. Different, colourful floral patterns are printed on each side of the bandana to give a great choice for any occasion. They are handmade from high-quality cotton and are absorbent and breathable. The bandanas stand up well to repeated washing. They fit any medium-sized dog perfectly but may be a bit too small for large dogs. A very special treat for a very special birthday girl. This is a pretty pink bandana, that will fit your little princess as long as her neck is less than 23 inches. It’s made from 65 per cent cotton mixed with 35 per cent polyester and has ties at the back to secure it. Your dog will be happy to wear it all day as it’s soft and comfortable. When the party is over, you can pop it back in the zippered back ready for next year! No birthday is complete without a birthday party outfit bandana. With this one, you’ll get a gorgeous pic to share with your friends and family on social media too. The design is custom screen printed in a light and dark blue bone, paw and cupcake print which shows up beautifully in digital photographs. ‘Birthday Boy’ is emblazoned across the front in a bright white font so there is no mistaking who the star of the show is! On a practical note, the bandana is 21 x 21 inches and will fit a pooch with a neck of between 15 - 23 inches so that’s most medium-sized breeds. It ties on at the back after you have folded it diagonally. Your pooch will find the pre-softened, 100 per cent cotton fabric very comfortable and when it comes to washing, just pop it in the washing machine and air dry. This set of two bandanas would suit a small to medium-sized dog with a neck of less than 20 inches and could also be used for a cat. The pack contains two attractive check patterned bandanas which are reversible so you get a total of four designs to choose from. They are made from a high-quality cotton so they are both comfortable and durable. They are easy to wash and stay looking great. Will your dog wear it? Most doggies like to think that they look extremely smart when they are wearing their bandana and will parade down the street with great pride. However, there are some pooches who are very fussy and do not even like to wear a collar. Why not practice with an old handkerchief or small towel for a few minutes to see how they take to it? No dog is going to like something coarse or stiff around their neck. Many bandanas are made from 100 percent cotton whilst others are a combination of cotton and nylon. Some puppy bandanas seem to be softer after they have been washed. The fabric needs to be robust and durable because dogs will be dogs after all! Fabric that frays easily is not going to be much use. The majority of bandanas are tied either by simply knotting the fabric together or with cords that are stitched onto the ends. Some are secured with fabric. This may be the safer choice but may come off more easily. Will it fit your dog? A bandana that is too small is a bigger problem than one that is too big. The owners of larger dogs (Labradors and bigger) often struggle to find one that will fit and some enterprising owners even end up sewing on extra cords to tie them. There are plenty of bandanas for medium and smaller dogs. If the small dog bandanna is too big, you could fold it over a few times. This is a matter of personal preference. Some doggy moms and dads prefer a quirky or novelty design such as a patriotic stars and stripes flag whereas others opt for a more traditional floral pattern. You can get puppy bandanas for special occasions, such as a birthday, with an appropriate slogan printed on them. It’s a great way for your pooch to feel that they are dressing up for a special occasion. For even more variety, you can get a bandana printed with a different design on each side. How is the dog bandana packaged? Some come gift wrapped and make an ideal present for a friend’s dog. Others are in a zipped bag which is useful for storage. Some dog scarves bandanas can be used to cool down your dog on a hot day because they are made of special fabric. Not only does it look good but it’s making your pooch more comfortable. Dog bandanas are primarily a fashion item. Your pooch will look super cool when they are wearing it and some dogs absolutely love them and wear them with pride. It’s a lovely way for them to dress up for a special occasion such as a birthday. Other pooches are not so keen on them! There are a few other benefits that dog bandanas can bring. Some dog scarves bandanas are specially designed to cool dogs down in hot weather. They are made of special fabric that will absorb a lot of water when you soak them. Once they are wet through, you tie them on to your pooch. As the water evaporates, it uses up energy. This energy is provided by the heat from your dog’s body and so cools them down. It works in the same way as the sweating mechanism in humans. You can use them on their own or team them up with a cooling vest when the weather is exceptionally warm. However, it is important to note that they are not a substitute for vigilance. It is never safe to leave your dog unattended in a hot environment. Traffic light bandanas are a popular way to let other people know about the temperament of your four-legged friend. Some dogs love to be petted and they could have a green bandana with ‘Friendly’ written on it. At the other end of the scale, a red bandana serves as a warning, especially to parents of children. It is surprising how vulnerable to accidents dogs are at night and in poor weather conditions. A bright bandana is a good way of making a dark-colored dog more visible to you and to car drivers. This helps to keep your pooch safe. If your pooch injures the tip of their ear, it can take ages to heal. This is because dogs constantly move their head around and this can reopen the wound and slow down the natural healing process. Bandages do not stick to dog’s ears! Therefore, your vet may recommend that you improvise with a bandana which will keep the ear immobile. Another option to try in these cases are liquid bandage for dogs. It is possible to buy bandanas which are coated in flea-repellent and the idea is that they work just like a flea collar. However, there are risks associated with this flea-control method and some owners are not happy about using strong chemicals on their pooch. They prefer to use a ‘natural’ insect repellent on a bandana. Whilst it is true that fleas and ticks can cause serious health problems for dogs, you also have to make sure that method of repelling them is also safe! Commercial flea products can cause anything from mild skin irritation to seizures. It is best to talk to your vet before using any. As for the so-called “natural” repellents, some of them contain a chemical called permethrin which is highly toxic to both cats and fish. So, if a cat comes into contact with the bandana or your dog goes swimming in a river, a lake or the sea, other creatures are being put at risk. There are also serious consequences if your dog chews his or her bandana. This sort of product may be best avoided. Dog bandanas can get a little mucky, especially if your pooch eats their food with it on. It is important that you are able to wash it to keep it in perfect condition. Most dog bandanas are made from cotton or from a combination of cotton and nylon so they should stand up to a gentle hand wash in cool water. Some bandanas are advertised as being machine washable but it would be sensible to err on the side of caution and use a gentle wash. Most need to be air dried. However, it is worth noting that a problem can arise with the fabric dye on the bandana. Some owners have reported that the dye ran when their pooch was wearing the bandana or in the wash. It may be worth checking that the dye is colorfast to prevent any issues. A: A bandana is a square or triangular piece of fabric that is worn around a dog’s neck. They are usually fastened at the back of the neck with ties or Velcro. Q: Are dog bandanas safe? A: Bandanas are only safe if they are used sensibly. As with any other dog accessory, there is a risk of it getting caught or stuck on a sharp object and this could cause injury. For this reason, they are best for indoor use and should never be left on a dog that is running free. They should also not be left on dogs that are unsupervised. In rare cases, they can cause irritation so choose a natural fabric such as cotton, limit the length of time that it is worn and be vigilant. A: Yes. It is not safe for a dog to wear a bandana when it is not being supervised and that includes at night. It could get caught on something and cause strangulation or it may fall off and get chewed which presents a choking hazard. Q: How can I put a bandana on my dog? A: It may be easier to stand behind your dog to put on the bandana. Once you have tied a secure knot (so that it will not move) you must be able to fit two fingers in between the bandana and your dog’s neck. If you cannot, it is too tight and needs to be put on again. 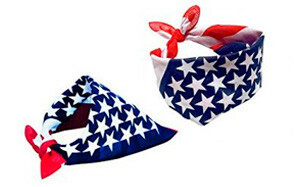 Your pooch will be the ultimate patriot in this bandana with a stars and stripes design. It’s made from durable nylon and comes pre-folded and ready to wear. It measures 22 x 22 inches and will fit any medium-sized dogs or can be folded over to fit a smaller pooch. It makes a perfect gift and you could even wear a matching one!